Winner of the Pulitzer Prize: "The richest and most powerful single document of the American experience in World War II" (The Boston Globe). 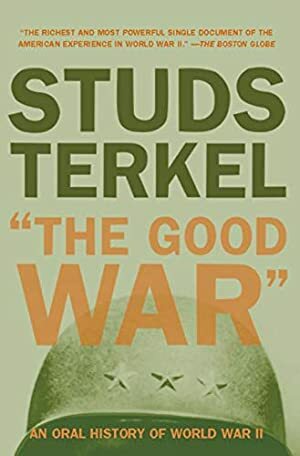 The Good War is a testament not only to the experience of war but to the extraordinary skill of Studs Terkel as an interviewer and oral historian. From a pipe fitter's apprentice at Pearl Harbor to a crew member of the flight that dropped the atomic bomb on Nagasaki, his subjects are open and unrelenting in their analyses of themselves and their experiences, producing what People magazine has called "a splendid epic history" of WWII. With this volume Terkel expanded his scope to the global and the historical, and the result is a masterpiece of oral history. Log In to track Studs Terkel on eReaderIQ. to be notified each time the price drops on any book by Studs Terkel. to stop tracking Studs Terkel. We started tracking this book on November 3, 2011. The price of this book has changed 91 times in the past 2,726 days. The current price of this book is $10.19 last checked 16 hours ago. The lowest price to date was $1.99 last reached on November 30, 2018. This book has been $1.99 8 times since we started tracking it. The highest price to date was $11.49 last reached on February 20, 2016. This book has been $11.49 6 times since we started tracking it. We last verified the price of this book about 16 hours ago. At that time, the price was $10.19. This price is subject to change. The price displayed on the Amazon.com website at the time of purchase is the price you will pay for this book. Please confirm the price before making any purchases.